What’s The Meaning of Mistakes? Most of the people I know have a hard time making a mistake. I can identify with them. Many times in my life or business dealings I’ve had that same fear of making wrong decisions. When a bold choice confronted me, my mind started churning on all the things that could go wrong. This kind of thinking used to freeze me up like a winter pond. But the ice broke when I finally realized that there’s no way to know if a decision is good or bad until after you make it. What if I could see both possibilities as steps toward success? What if I could give myself the freedom to make a mistake? I realized I would be more willing to make the bold moves that lead to invention and innovation—true watchwords of success. 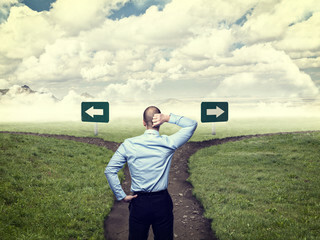 If your choice turns out to be right, you take a step forward. If your choice turns out to be wrong, it informs your next choice—and still, you take a step forward. If you don’t give yourself the freedom to fail, you take no steps forward at all; you just stand there, indecisive and afraid. And voilà, your fear of failure becomes failure by default. Sometimes all the time we spend trying to decide something becomes failure in and of itself. Inaction is failure. And tentative, uncommitted action can also lead to failure. Wise men and women can help us avoid some mistakes by sharing what they’ve learned. But they can also be examples: if you listen to them you’ll notice that most of what they learned they learned by making mistakes. Some of that mistake making you’ll have to do for yourself. Unless you only want to achieve what they have already achieved, and why waste time on that? It’s ironic isn’t it? Often the fear of messing up is what makes us mess up. Why? When we’ve set up an inner judge to stare over our shoulder, watching and waiting for us to mess up, we become nervously ineffective. When that internal judge promises to label us a failure for each mistake, our movements become constrained. We are no longer freewheeling and creative. We are no longer at our best. Our mind expends so much energy trying to guess how not to screw up that it has little energy left to imagine the possible actions that would lead to success. Leaders are most likely to turn to me for coaching when they’re struggling with a problem, a transition, or a tough decision. Sometimes their choices involve risking tremendous amounts of money, respected reputations, or important relationships. I have compassion for people facing these kinds of choices. Yet, I often see leaders put themselves through unnecessary suffering over the process, even when they can’t possibly predict the outcome either way. He didn’t agonize or let himself get paralyzed with the fear of failure. After you’ve done your due diligence and researched all the pros and cons of the choices before you, it’s time to either listen to your gut, or just put your finger on the map and go. Don’t waste your time and the time of others. Get bold, make a move, and watch what grows. If you don’t see success growing outside you, stop and take a look inside yourself. That’s where the growth will happen, if you’re willing to accept failure, learn from it, and move on to the next tough choice.